The Jury’s appraisal:The installation begins with the observation and valuation of, on one hand, the landscape appeal of agricultural activity of corn fields in Extramadura, and on the other, the former’s relationship with astronomical phenomena. 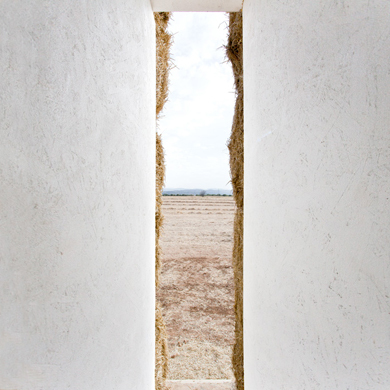 The contrast between the exterior image, which reinterprets the characteristic stacking of hay bales, and the interior one which is white and abstract, creates a poetic whole for the observation of the surrounding landscape and pays special homage to its position in relation to the stars. Intervening on a landscape such as that of La Nave Va, in Berrocalejo, constitutes an attraction for multiple conditions. 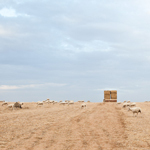 On one hand, the beauty of the wheat fields, the characteristic landscape of the Spanish central plateaus, that empty, vast landscape that changes with the seasons and fills you with a sense of calm. 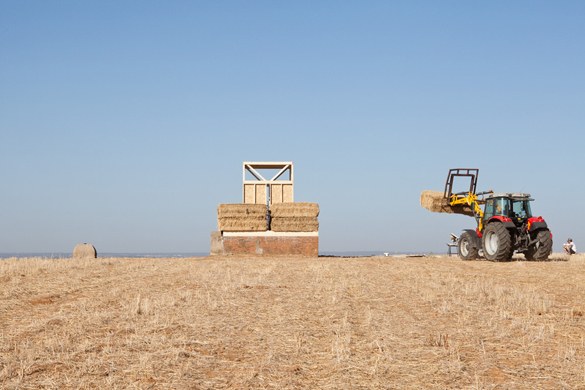 On the other, the power of spontaneous artistic interventions carried out in an unconscious and tremendously pragmatic manner by the farmers when they stack the straw bales after harvesting the cereal. 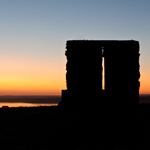 In our eyes, these interventions on the landscape create an aesthetic “Land Art” effect in themselves. 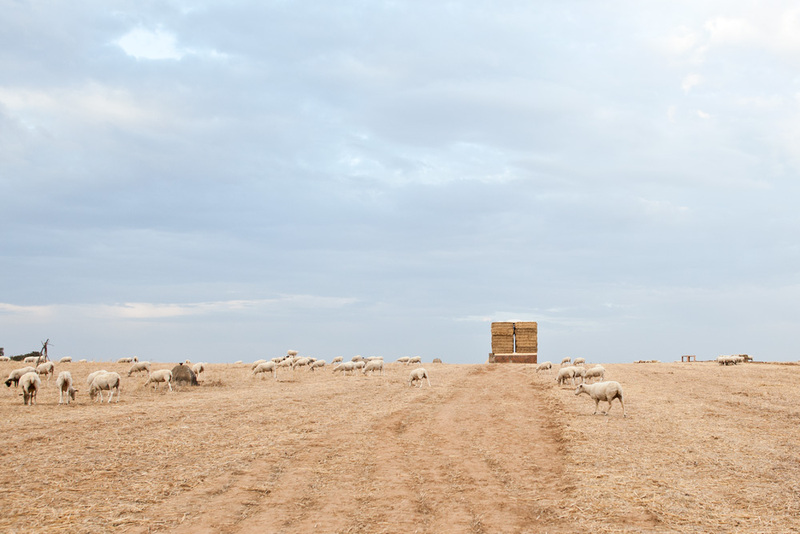 The Harvest Moon Pavilion seeks to be a place from which to interpret and feel the surrounding landscape, a place for meditation, celebration and observation. 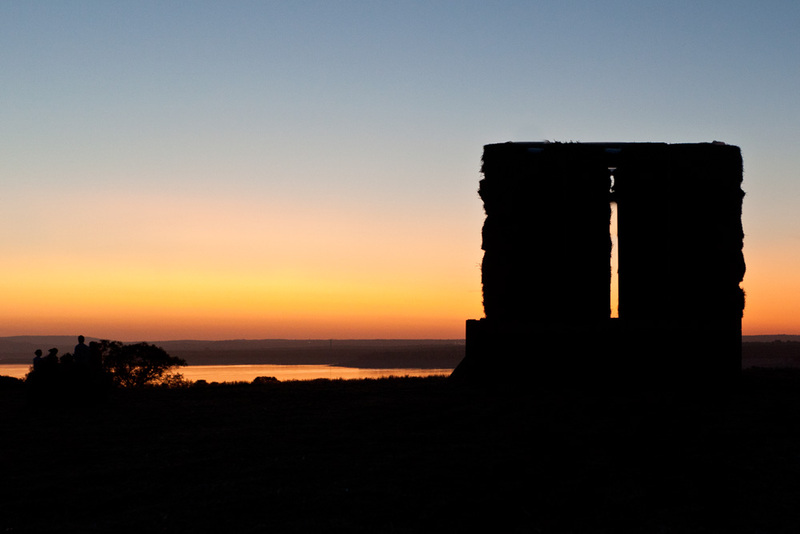 A space which, protected from the harsh weather of Extremadura’s countryside in summer, allows you to be, inhabit and perceive. 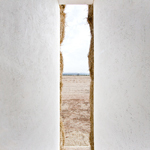 In the landscape we encounter a pre-existing structure: a small brick water tank that, without knowing the reasons that led to it, precisely faces the sunset on the 6th of September, the day of the harvest moon. The full moon rises just at the time of sunset on the opposite side. 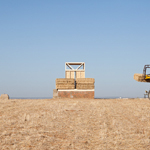 The pavilion is a 5x5x5-metre cube made from large-size straw bales (2.4x1.2x0.7 metres), stacked in the same way as in the fields with farming tractors. The interior contains another cubic space painted in white and measuring 2.5x2.5x2.5 metres. The choice of materials is simple and coherent in many ways: the straw bales left over from the harvest and reutilized as livestock fodder as a material belonging to the place; solid wood in standard profiles typical of American slat constructions for rapid execution without the need for specialised labour; and board made from OSB shavings from reusing wood production waste, which shares its material perception with straw. 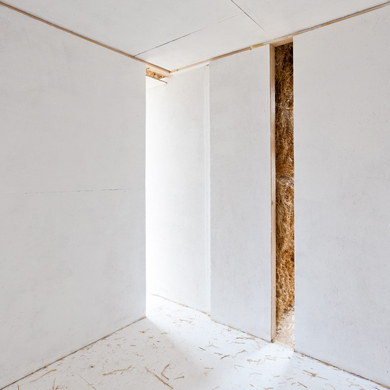 A platform of wooden beams and OSB board rests on the existing solid-brick water tank, supporting the interior cube in a wood and OSB framework painted in white, which is then clad in straw bales. Localización Location: Berrocalejo, Cáceres, Spain. Diseño Design: Pablo Saiz Sánchez, arquitecto. Equipo de montaje Assembly team: Ramón Flores, Pablo Saiz, Ana Izquierdo (Modulab), José Manuel Fenollar (Modulab), Nando Abril, Leo Mateos. Tractoristas Tractor drivers: Silverio Muñoz Rubio, Macario Ramiro García. Maquinaria Machinery: Tractores John Deere 5075M, Massey Ferguson MF5700 S. Promotor Developer: Pepe de la Pisa. Constructora General Contractor: Ramón Flores. Fotografía Photography: Paula Arroyo | Ojovivofoto.